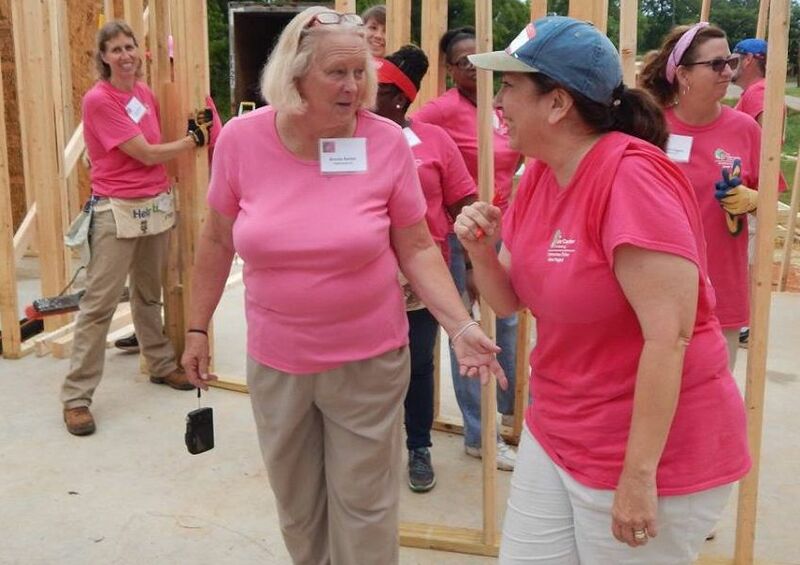 Photo: Brenda Barton (center) shares a laugh with Dianne Fuller during the 2015 Lind-A-Hand women’s build in Lanett, Alabama. When Brenda Barton passed away on Jan. 30, 2019, after a brief illness, individuals and groups throughout The Fuller Center for Housing’s ministry lost a tireless advocate for their work and a treasure trove of information on topics ranging from financial policies to setting up partnerships to managing the chaotic miracle of a blitz build week. Among those groups with whom Brenda worked closely is the Fuller Center Disaster ReBuilders, who have been busy the past two years with Hurricane Harvey recovery in Texas and the past few months with Hurricane Florence recovery in North Carolina. Beginning May 26, 2019, the Disaster ReBuilders will build two homes over the course of one week in Galveston, Texas. While Brenda will not be on hand to help manage the build, she most definitely will be there in spirit. It’s being called the Brenda Barton Memorial Blitz Build to honor her legacy of service. Tucker encourages volunteers wishing to participate in the build to register soon because registration is limited to 60 participants, although about 20 volunteers are also needed the previous week for preliminary work. The fee is $100, and volunteer lodging is provided, as well as dinner Sunday-Thursday, lunch Monday-Friday and breakfast Monday-Saturday. The registration process is the same as for any Disaster ReBuilders week in Texas, which you can learn about on their Fuller Center webpage, or you can go directly to the registration page at the link below.